Joe and I obviously have far too much time on our hands. This year's chilli-growing is not going well. The first promising hopefuls to graduate from seed to seedling were murdered by the wanton negligence of my mother, who didn't feel like watering them in my absence. One of the plants did survive this torrent of cruelty so I gave it to a friend as a birthday present, enjoining her to take good care of it. The second batch were getting by quite comfortably in the garden at Gray's Inn Rd, until one morning I found they'd been ravaged by a snail, which I found sleeping off his banquet next to the mauled plants. So I'm now down to my last throw of the dice: I've put the late developing seedlings out in the garden, hoping they will survive the caprices of the weather and the machinations of snail. 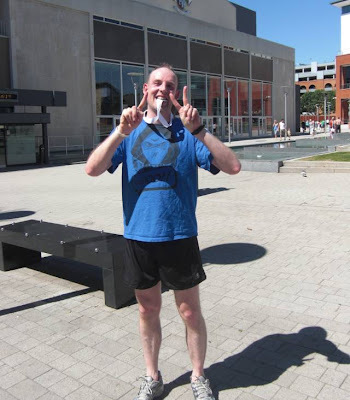 On Sunday May 23rd, after five months of training, one drunken press release, four copies of Runner’s World and no early nights whatsoever, I jumped out of bed ready to complete the final leg of my Human Rights Half-marathon Hat-trick. 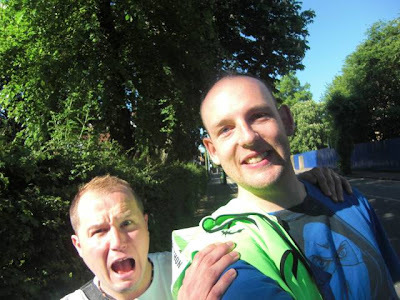 I met Ed outside the pub at the bottom of my road after breakfast and we set off to the race start together. We had both run the Cov half seven months previously: last year it was held in October. This year, for some reason, they decided to shift it to the end of May. 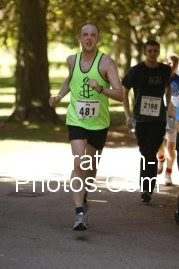 Predictably enough, it was fiercely hot, so I wasn’t planning to try for a new PB. I was planning to have a celebratory barbecue afterwards though. Despite the sweltering heat, the race had attracted the usual assortment of people in fancy dress – there was a bunch of banana costumes, Peter Pan, Superman and a giant hamster, among others. There is a brilliant passage in The Looniness of the Long Distance Runner by Russell Taylor in which he describes an affliction called Get the Womble, which affects inexperienced runners. Thankfully, I read this before Batman and Robin left me standing at the Sheffield half. I actually caught Batman around about the ten mile mark, but I didn’t see Robin again, meaning either I missed him in the excitement, he dropped out or – worst of all – he finished inside one hour forty. 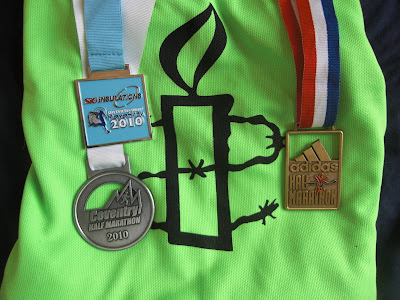 There were well over 2,000 entrants for the Cov half, although there weren’t anything like that amount of finishers. I did hear reports of people walking away before the race, discouraged by the heat. Ed and I met up with Breen, another lad off our football team just before the start and off we set together. About a mile in, we got overtaken by a guy whom Ed dubbed ‘the Roadrunner’, who was taking tiny steps but at a higher turnover rate than an Olympic sprinter. Part of the reason for his unorthodox gait might have been his footwear – he was rocking a pair of those weird rubber sock-shoes with individual toes; as an article in Runner’s World put it, the £100 pound pair of shoes which simulates not wearing a pair of shoes at all. He hyper-shuffled his way off into the distance. We weren’t foolhardy enough to give chase. On top of the heat, Coventry is a really hilly course and the miles weren’t exactly flying past. Truth be told, I threw up a tiny bit in my mouth while we were running up Torrington Avenue, although I could merely have been experiencing a nauseating flashback to fruitless Monday trips to Jobcentre Plus. Although I’m not bad at ignoring Wombles, superheroes and similar, I do tend to get a bit pin-eyed if I see other charity runners ahead of me. Perhaps we could call this syndrome ‘Get Macmillan’. Anyway, at the start of the race I’d noticed a gang of people running for a children’s charity in lurid fluorescent vests almost identical to my own. Coming through Warwick Uni and entering the really back-breaking part of the course, I saw one of these vests up ahead. I’m not stupid enough to start sprinting when there’s still five miles to run, but I did put in a bit of an effort to reel this guy in. Imagine my horror when I caught up to find he had Somewhere-or-other Striders on his back – just a club runner with a particularly horrible vest. Worse still, he was looking smooth and relaxed and I’d just wasted a bunch of energy catching up with him and felt knackered. The course headed up Gibbet Hill onto Kenilworth Rd, downhill again, then uphill again. Strider, who’d been dogging my heels for about a mile, suddenly lost interest and started walking. I didn’t know whether to feel glad I’d outlasted him or apprehensive about what effect the conditions might have on me over the last four miles. Into the Memorial Park we went and – glory of glories – I overtook the Roadrunner! He was still pottering along with that quick-stepping gait which makes a race walker look like a triple jumper. Past him I went and moments later he was hauled down by a famished-looking Coyote on Acme rocket skates. Ignoring the ferocious snarls and distressed ‘meep-meep’ noises behind me, I plodded on, leaving the park and entering the final mile. One runner had given up and taken refuge from the blazing sun in someone’s garden hedge. When asked, he said he was fine but he was definitely staying put. Half a mile to go. A couple of kids washing their dad’s car with a hose and drenching grateful runners as they go past. Across the ring road and back into the city centre. Quarter of a mile to go and, with a bit of a push, I could still go inside 1:45. 300m, 200m... Crowds of people on both sides of the road, I’m running hard, shouting at myself like a weirdo... Past one final runner, ruining his race finish photo and over the line about fifteen seconds inside my target. Pump fist, blunder over to side of road, collapse heavily against barrier in the shade, no more running. After collecting my bag, I went down to the first aid / physio tent. Happily, I was assured that genuine injury was not a prerequisite for a leg rub and all comers were welcome. It seems I was the first person to investigate this: there were no other runners in the tent and I ended up with one masseuse for each leg. I came out of the tent and – conveniently enough – Ed was standing right outside. He’d had a tough time and had suffered the indignity of being overtaken by the banana bunch. He reported that one of the bananas had collapsed of heat exhaustion in the Memorial Park. I asked if anyone had trod on him and slipped over. Off we went for a well-earned pint and to prepare for the barbecue, our running complete. Of course, we are running our first marathon at Loch Ness in October so it’s not time to bin the running shoes just yet.